Learning from the Past, Practising in the Present, Visioning for Future. 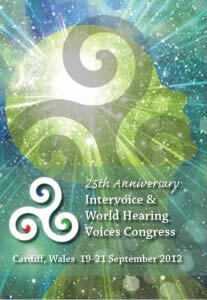 This year celebrates the 25th anniversary of the formation of the Hearing Voices Movement. Over the last 25 years the network has helped countless voice hearers gain ascendancy over the negative impact of the voice hearing experience. Alongside this, the network has acted as the vehicle for change in professional practice. On the 19th 20th and 21st of September 2012 the Hearing Voices World Congress and the annual Intervoice meeting will be held in the All Nations Conference Center, Cardiff, Wales. Cardiff has many nice places to stay. Hotels near the conference venue are The Holiday Inn and The Park Inn. We have negotiated a conference rate at both hotels. To book at room at either of these hotels at the conference rate, quote “Working to Recovery”. For more details, download the Hotel and B&B Details document below. Trevor Eyles and our colleagues from Denmark are hiring a bus to travel from Stansted Airport to Cardiff for the Congress. The bus leaves around lunchtime on Tuesday 18th September and leaves Cardiff on Saturday morning on 22nd September. If you would like to book a place on the bus, please contact Trevor on [email protected]. The more places they fill, the cheaper it will be for all.